The Project Support Office coordinates the University’s research and innovation project work, including raising awareness of opportunities, a proposal support service, partner and funding searches, project management and governance and research-enterprise development. In the Project Support Office you will find experts that are passionate about the impact that is possible from knowledge exchange. How research and innovation can change lives, help business and improve understanding of a society that is constantly changing. You will find a total of 112 years’ experience bidding for funding and similarly technical advice on how to deliver your projects. With access to Local, National, European and Global academic and partner networks we help realise the Research and Innovation priorities of our Faculties and Research Centres. If you have an idea for a project or research proposal, but you don’t know which organisations might be interested in funding the activity, you can contact your Funding Information and Research Officer (FIRO), who will offer advice and guidance, and support you to conduct funding searches using our funding database subscriptions. They can also provide training on these databases to enable you to get the most out of them. The more your FIRO knows about your research interests or project ideas, the more they can tailor searches to help you find the right funder. FIROs can also work with Research Groups to help develop funding plans to support you to identify the funding routes and options that you may, collectively, wish to target over a 3 – 5 year period. Vicky Brett provides support for FSE and FoSS. Our specialities are based around the funding streams; we will partner you with to the most suitable bid developer depending on the funding stream you are applying to and type of bid you are intending to submit. The Project Support Office subscribe to a number of funding databases and organisations in order to be able to effectively support bidding activity. If you would like us to search for funding for you, please do not hesitate to get in touch with the Project Support Office Team by contacting us on funding@wlv.ac.uk or 01902 32 3864. As a University, we subscribe to some online resources where all staff can set up accounts. You can subscribe to the websites below to search funding opportunities and policy news and, to set up alerts which are customised to your needs. The University of Wolverhampton has an institutional subscription to Research Professional which is a large searchable research funding database covering a broad range of disciplines and a new service, Funding Insight. 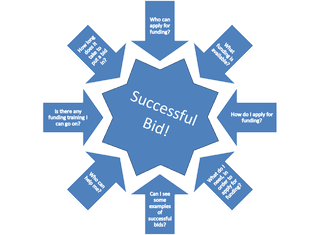 Funding Insight contains useful resources to support bid development including 'know how' guides and interviews with successful bidders and those who will be assessing submissions. In addition to providing searchable funding opportunities, registered users can subscribe to receive regular newsletters and ‘funding alerts’ covering issues affecting the international research community. You can access the website from on a University Campus without registering but will not be able to customise and save information. The UK Research Office (UKRO) is the European office of the UK Research Councils. Developing and maintaining a suite of quality services that meet the evolving needs of sponsors and subscribers. The University of Wolverhampton are a subscribing member so staff can register and use the subscriber services section of the website, browse EU funding opportunities and policy updates and, set up alerts. GrantFinder is a one-stop-shop of funding information, a service that contains thousands of funding opportunities. As well as research and development opportunities, there are a wide range of projects including facilities build, partnership working, business and community engagement, spin-off support and more. Use GrantFinder to keep up to date with the latest funding updates, set up email alerts and news alerts to receive regular updates on new and relevant funds. PSO can provide expert advice and guidance to support you with your bid from idea stage through to submission, contracting and beyond. We have experts in different funding streams who have in-depth knowledge of funders and funder requirements, and can offer a range of support that can be tailored to your needs. If your bid is over £50,000, or you are in an area not listed above, please contact us on funding@wlv.ac.uk or 01902 32 3864, so we can identify the person in the department best placed to support you based on your needs. We also have the role of Institutional approver on funder submission systems, such as JES. Therefore, if you are developing a bid that needs to be submitted through a funder system requiring this additional level of institutional approval, please contact PSO as soon as possible to allow us to ensure there is someone available to review and approve when you are ready to submit. The Project Support Office provides technical expertise, resources and support to maintain project and contract compliance and through strategic collaboration with our University Research and Business Engagement teams. PCB provides an integrated and consistent approach to costing projects and gaining University approval for all research and commercial projects through to bid/tender submission. In order to brief staff about bidding processes and specific funding systems and schemes, the Project Support Office offer workshops and briefings within the University. We also signpost colleagues to external events that we feel may be beneficial. We email our target audience directly for all workshops and events. Providing intelligence and advance warning of EU policy and funding developments specifically focusing on the funding programme for research and innovation, Horizon 2020. Raising the profile of the University of Wolverhampton, its research base and individual academics with key policy makers and funders in the EU and organisations across the EU. Creating links through networking, brokerage events and partner searches with other European regions, R&D liaison officers and National Contact Points in support of transnational project development. Facilitating training on the European funding, proposal development and bid writing. Providing proposal development services to the academic staff at the University of Wolverhampton. Delivering partner searches for the European funding proposals and approved projects. Offering placement opportunities for the graduates, doctorate students and research staff.